WHY A ROCK? Dating back thousands of years, it has been customary in the Jewish faith to leave a small rock on a headstone in order to let others know that someone has visited the grave. It also enables visitors to participate in the mitzvah (an act performed as part of religious duty) tradition of remembering and honoring the deceased and the burial site. Stones last forever like memories of the deceased loved one. In June, a “rock party” was held in St. Louis, MO for interested friends of Robin Park, Board member of The Matzevah Foundation. 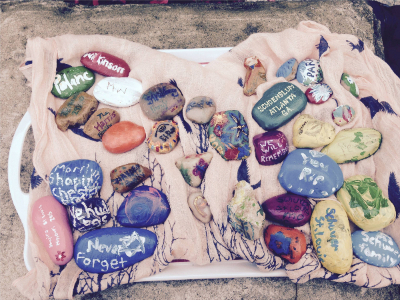 A special message or small picture was placed on the rocks that were then blessed by Father Bozek, a Polish priest in St. Louis. The rocks were flown in early July with a group from The Matzevah Foundation to Krzepice, Poland where each stone was placed on a matzevah on the last day of work in the cemetery to honor the memory of the deceased. 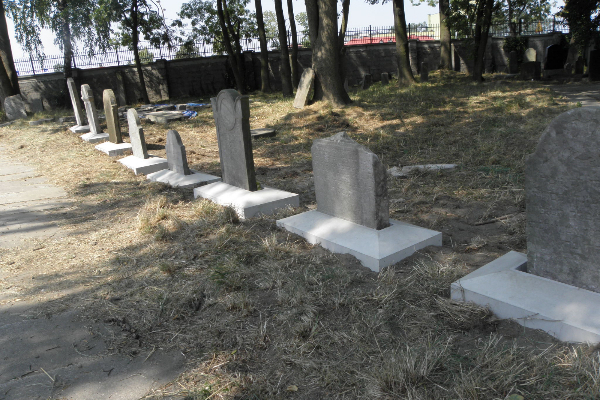 Krzepice Jewish Cemetery Restoration Project – July 10-19. Krzepice is near the western border of Poland with Germany and was one of the first small cities to fall to the Nazis. Until World War II, the population of Krzepice was more than 40% Jewish. In June and July 1942, most of the Jewish residents were sent to Auschwitz extermination camp. The few that survived subsequently left Poland. The Synagogue stands unused today and is in poor repair. 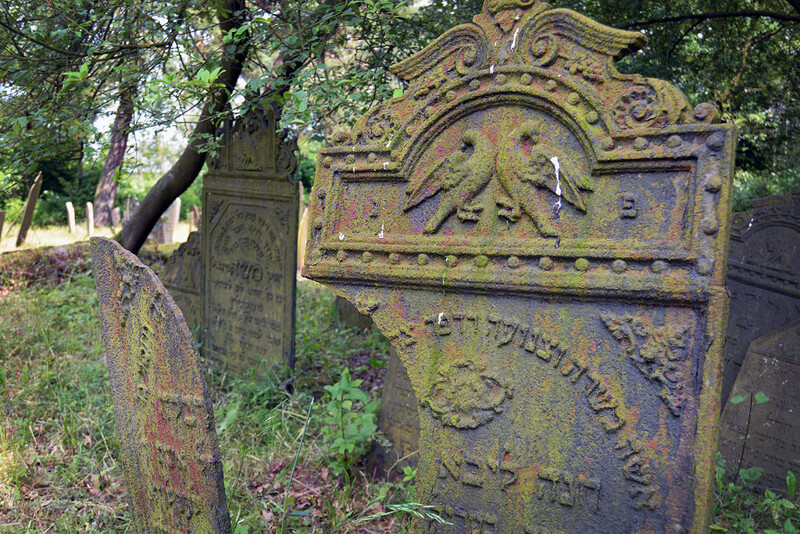 The cemetery has many beautiful iron and stone matzevot which date back to the mid-1770’s. 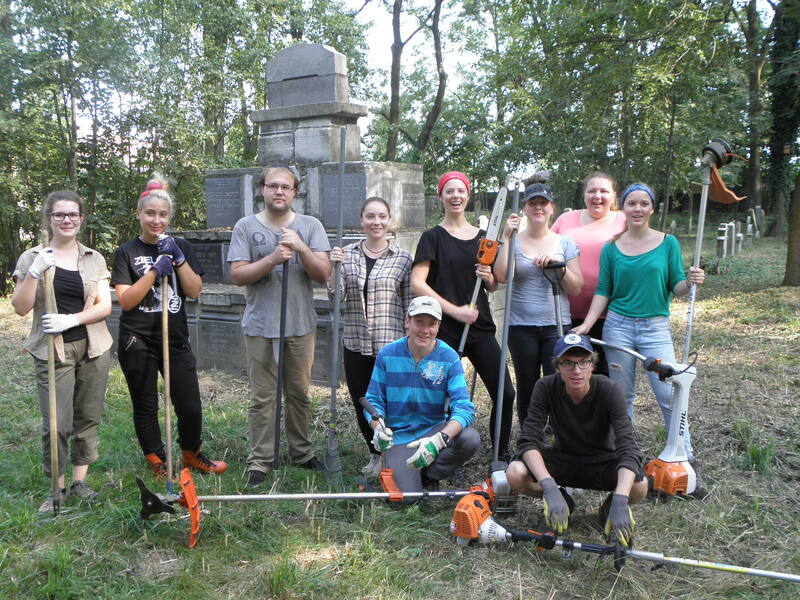 Three members of The Matzevah Foundation and one student volunteer from St. Louis, MO worked in the Jewish Cemetery in Krzepice. During the week, portions of the cemetery were cleared of undergrowth, small trees, and debris. Our work was done in cooperation with the Rabbinical Commission for Matters of Cemeteries and the Katowice Jewish Community. We were also joined by teachers and students from the high school in Krzepice as well as volunteers from Otwock, Poland. We would like to extend our thanks to our friends in St. Louis, MO who graciously donated funds that allowed us to purchase new equipment that we used in Krzepice. Thank you to our donors who helped us purchase new equipment for our work this summer! Oświęcim Project – August 7-16. Returning to Oświęcim for the third year, The Matzevah Foundation had the wonderful opportunity to work alongside young adults from Action Reconciliation. The volunteers came from Bulgaria, Poland, Germany, Holland, Russia, and Ukraine. 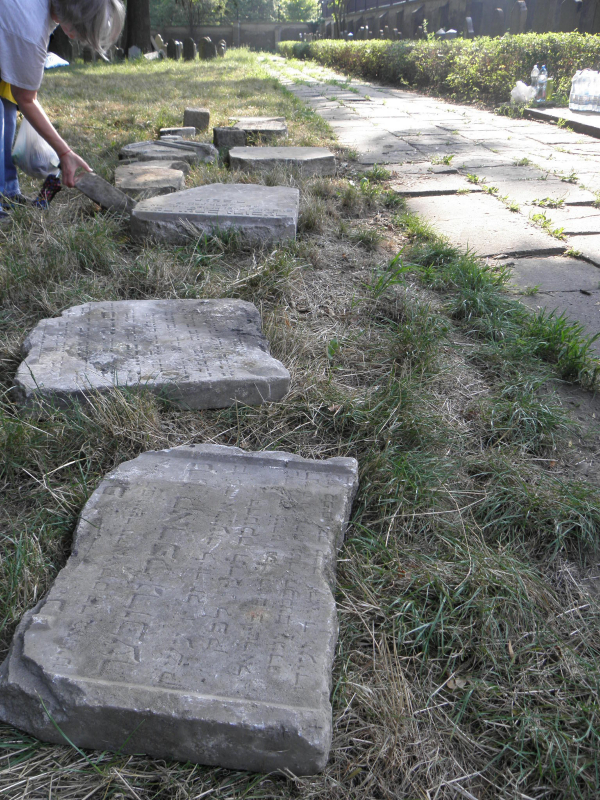 Five days were spent in the Jewish Cemetery clearing debris, removing fallen limbs, cutting weeds and small trees, and locating broken pieces of matzevot (gravestones). During this project, the Auschwitz Jewish Center was contacted by a landowner just outside Oświęcim who stated that he had several matzevot he wanted to return to the cemetery. The gravestones were delivered on Wednesday. After more than 70 years, the arrival of the matzevot was exciting and we were grateful the family would return the gravestones to their proper place. 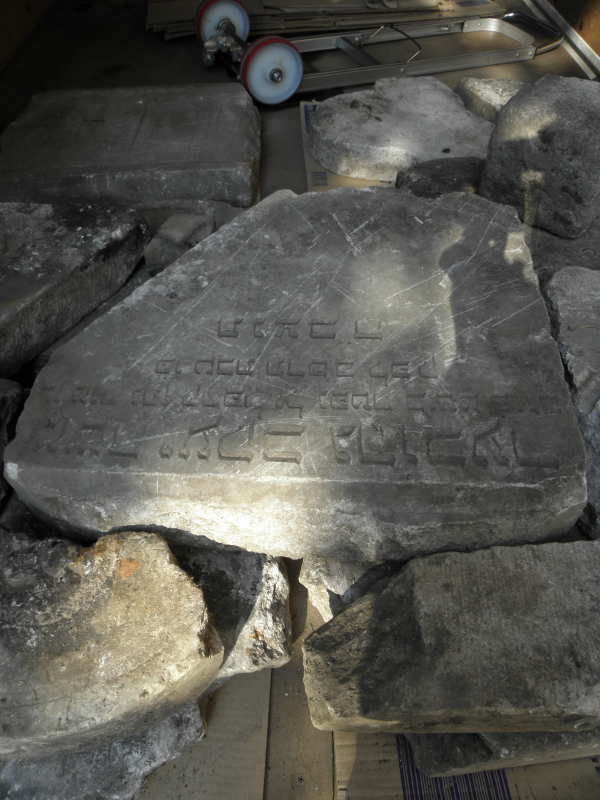 The Matzevah Foundation and Brentwood Baptist Church in Nashville, TN purchased 25 base forms in which to stand displaced matzevot along the inner walkway of the cemetery. These were delivered on Thursday and the very arduous work of preparing, leveling the ground for the bases, and lifting a matzevah into each base was begun. This work was accomplished through the coordination with the Auschwitz Jewish Center, Action Reconciliation, and MDSM. A special thanks to the volunteers with Action Reconciliation for their very hard work in the cemetery, their thoughts about the project, and also time spent with the TMF volunteers sharing some of the culture of their homes countries.